In just the past six years, the U.S. Supreme Court legalized gay marriage, the Tinder app accelerated casual dating, Fifty Shades of Grey was an overnight sensation, and Bruce Jenner became a woman. None of these events surprise Thomas Weinberg, professor of sociology. 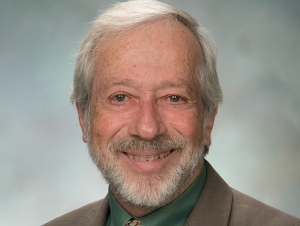 Weinberg, who has taught at Buffalo State since 1969, has published five books, eight book chapters, and numerous articles in peer-reviewed journals on sexual behavior. From a Classroom Building office decorated with photos of his wife, son, and an assortment of household pets, Weinberg has quietly conducted exhaustive research on people hovering on society’s margins. In the process, he’s helped the public understand topics ranging from gay men’s alcoholism to sadomasochism. “We humans are in a continual state of becoming. Identities can be created, tried on, and discarded by the individual. We are not simply passive recipients of labels; we do interpretive work to figure out who and what we are,” he writes in the introduction to one of his most recent books, Selves, Symbols, and Sexualities: Contemporary Readings (Sage Publications, 2015), which he edited with Staci Newmahr, associate professor of sociology. The book includes brand-new research from sexuality experts and first-person accounts of individuals interested in stripping, prostitution, and transgender identity, among other topics. “Like anything else worth studying, human sexuality has a sociological base,” he said. Despite the popularity of books and films with deviant sexual themes, such as E.L. James’s 50 Shades of Grey and Anne Rice’s Exit to Eden, he said, that lifestyle is not broadly accepted. “People who engage in this behavior remain on the fringes of society,” he said. Weinberg has developed compassion for those living on the fringes throughout his career. Interviews he conducted on gay identity in the early 1970s revealed the pain many homosexuals endured while coming to terms with their sexual orientation. Weinberg expanded his research into sadomasochism at a time when little was published on the subject. He and Sociology Department colleague Gerhard Falk did extensive interviews, and their findings were published in the Bulletin of the American Academy of Psychiatry and the Law (1979). Weinberg also published an article in the sociology journal Deviant Behavior. Weinberg was recently recognized for his body of work in the study of human sexual behavior, as well as subareas of race, identity, homosexuality, and substance abuse, with a 2017 SUNY Chancellor’s Award for Excellence in Scholarship and Creative Activities. Weinberg’s newest book, The American Drug Culture (Sage Publications), co-authored with Ursula and Gerhard Falk, will be released in January. It includes a chapter on sexuality as it relates to alcohol, as well as chapters on drugs and popular culture and alcohol’s costs and benefits. Reflecting over his long career, Weinberg said he’s proudest of his work on gay research because it was motivated by a desire to help individuals deal with difficult issues such as identity and rejection. While Weinberg acknowledged greater acceptance for homosexuality today, including the inclusion of LGBT clubs in high schools and colleges, he said gays continued to be victimized.